It's been awhile since I have done a Friday Favourite so this one is long. My MacBook died last month and I had no idea how much I used it until it no longer worked. My reading of blogs and writing my own blogs are done primarily on that device while watching TV with Greg after procrastinating all day about reading and writing haha. The theme this week is a mix of new things and "new to me" things. 1. Well this doesn't really fit the theme but the rest do. Finley started the school year in Grade 3 and then was moved to a 3-4 class. 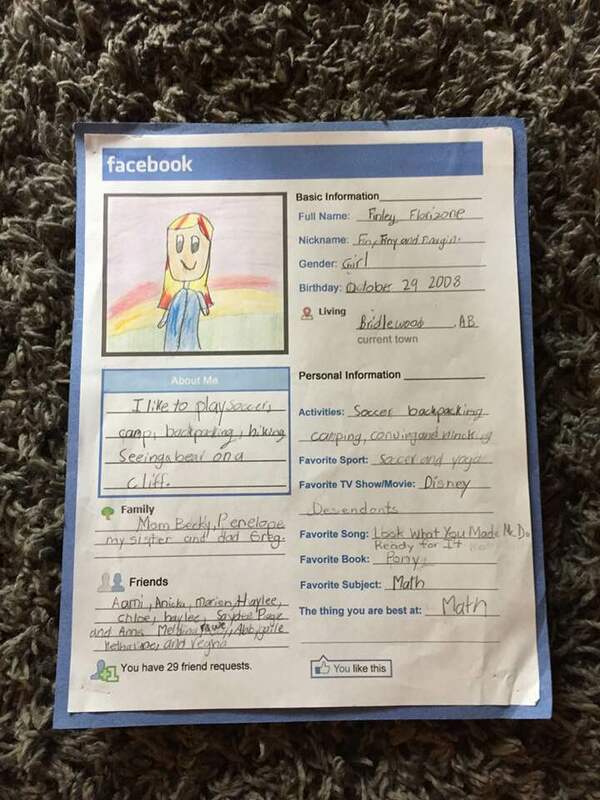 In an effort to get the students comfortable with one another, her teacher had them write a Facebook page and talk all about their likes and interests. 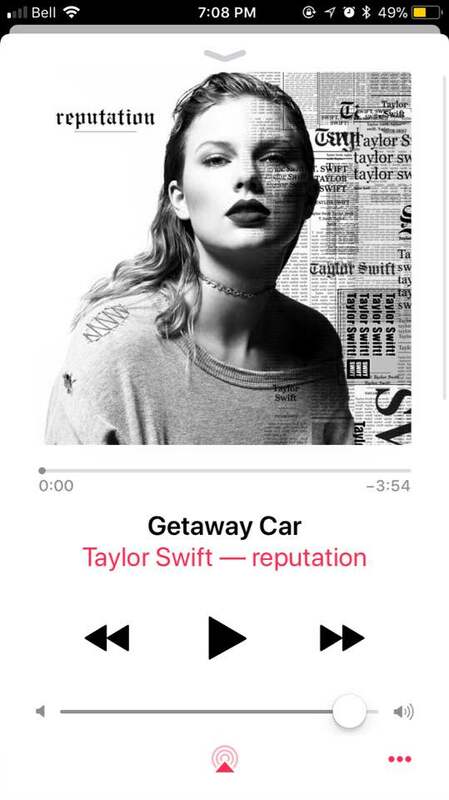 I have noticed that she loves all things math, Taylor Swift and being active whether it is outdoors or indoors. 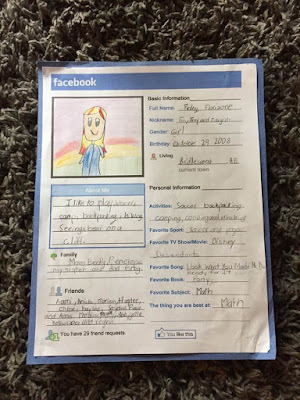 It made me happy to read all about her likes and interests. None of it was at all surprising though haha. 2. My fellow lulu-loving friend Alex has been obsessed with scrunchies since they first came out in the 80s or whenever it was. I made fun of her constantly for having them even when Lululemon came out with a bunch last year. 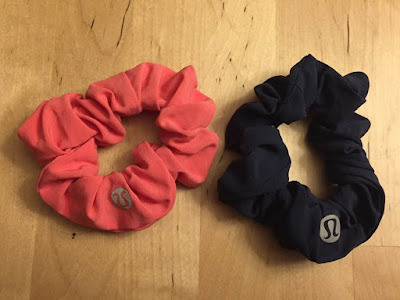 I bought 2 scrunchies for the girls at SeaWheeze in Vancouver and liked them a lot. I had cut my hair in August so it is too short for the massive ones so I couldn't borrow theirs. Last week, I was in there and bought the blue one and I loved it so much, I bought another one this week when I was in there. If you have super thick and heavy hair like me then you will love these. These make me so not afraid to grow out my hair again because they can handle the weight of it. They cost $8 which is a bit pricy but trust me, if you have hair like mine or Finley's, it is well worth the expense. 3. 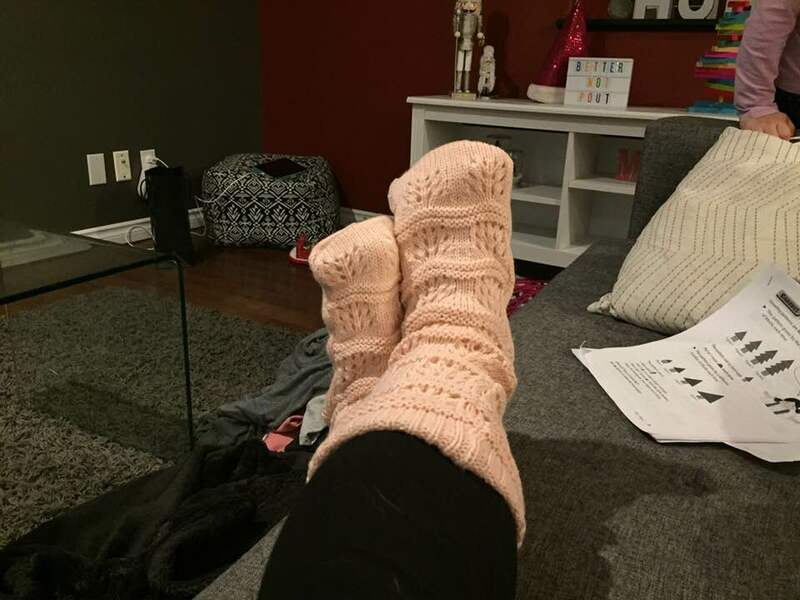 I have wanted a pair of reading socks since I saw them at Chapters a few years ago. However, they were always way too big for my small feet. Every season they would come out with new ones and every season I would try them on and every season I would leave empty handed because they were always too big to wear. Last winter, they released kid versions of the reading socks which made me very happy. 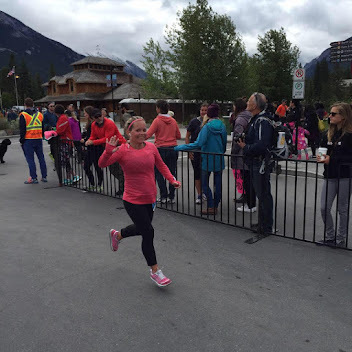 However, despite finally fitting my feet size, they were too tight in my massive calves thanks to all the running i do. I officially gave up hope on ever owning a pair. Until Monday. I was at Walmart grabbing something and saw these hanging in the seasonal section at the front of the store. I tried them on, not expecting them to fit and to my surprise, they actually did. They might not be as pretty as the chapter ones but they fit and they are pink and they were only $8. 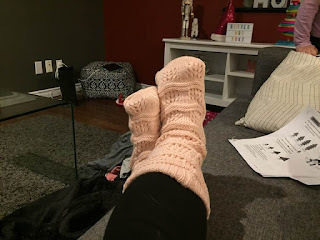 I can't wait to spend cozy mornings and days in my reading socks! Maybe I will actually get some reading done haha. 4. 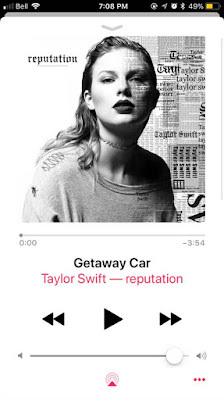 A week ago, Taylor Swift's new album came out and three out of four of us were dying to hear it all for the first time. Can you guess which one wasn't? I have been a huge TSwfit fan since the very beginning and by default so have my kids. Or at least since their beginnings haha. It was the longest break between her releasing albums ever and it was worth it. I love this album even if it doesn't sound like anything she has ever done. It's hard to pick a favorite song because I love them all so much!!!! Haha I am starting to sound like Finley but seriously go find it on iTunes or Apple Music! Now to the "new to me" portion of this Friday Favorites. 5. 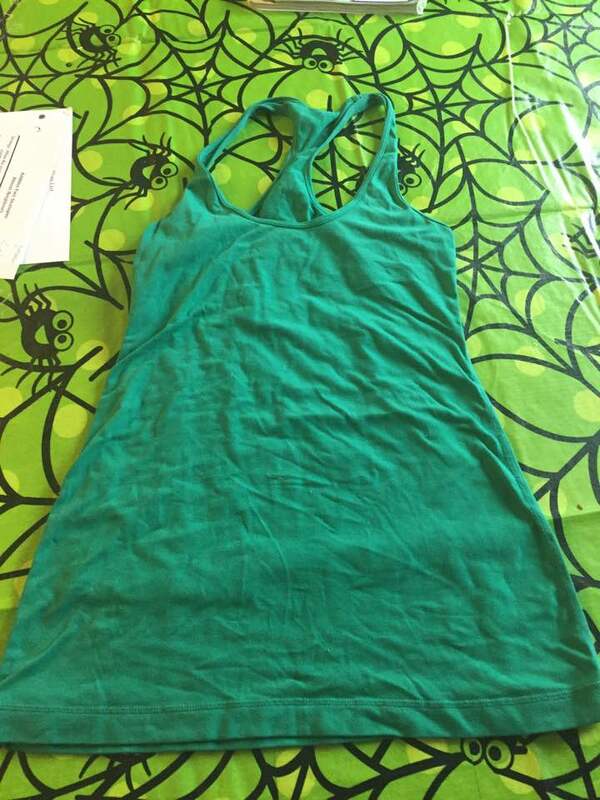 I purchased this Lululemon CRB for $6 on the Facebook auction site. Yes you read that right, $6 and there is nothing wrong with it either! CRB's are my favourite workout tank and I have a bazillion of them (ok not quite but I think last count was 32). I have a lot because sometimes I can wear 2 or 3 a day depending on what my activities look like. 6. I have begun to notice that every time I bake or cook I make huge messes - mostly on myself and I have started to notice marks on some favourite clothes which does not make me happy at all. 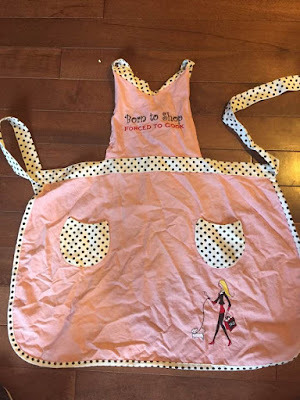 So I found this apron on the Facebook auction site for $1. It says Born To Shop Forced To Cook which made me laugh. So far I have only worn it once because I keep forgetting about it until I notice I have crap all over my clothes. Hopefully I remember to wear it come Christmas baking season. 7. I love the look of winter boots but hate winter boots on me. 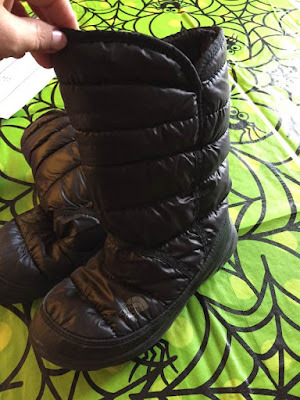 For some reason, I cannot find this style or Sorel style of boot that fits me in my heel. It is so frustrating and has left me without any boots for awhile now. 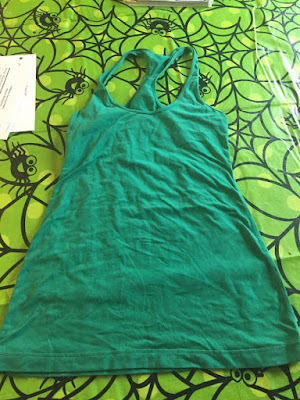 I found this on a Facebook buy n sell site for $20. They still are not as snug as I would like on my heel but they are the best I have ever found thus far. Well worth the money.